Sorry for the delay but I am finally getting around to posting the fat quarters I got from the sew mama sew fat quarter swap. Sarah from frog creek cottage sent me some wonderful fabric and blueberry tea! How thoughtful. Thank you so much. The purple background color on the veggie fabric is far more vibrant than this picture shows. Jennifer sent me some really fun fabric. One is a Japanese print that has little French storefronts and the other one has great little green flowers on an orange background. It is Mambo by Windham Fabrics. I have to come up with the perfect project for the French storefronts. They are so stinkin' cute! Thank you for being so thoughtful. Everyone, be sure to stop by her etsy store and check out her wonderful handmade items. Stephanie (sorry no link, if you see this and have a blog, please let me know) sent me a handmade notecard and envelope along with a nature inspired fabric. The background is a light cream. What a nice addition to my stash! Thank you! Kelly sent me the sweetest pink floral print from the Poetry Collection by April Cornell for Moda. The little dark pink polkadots in the back are just a perfect addition to the delicate pink flowers. Thank you! Lisa (sorry no link, if you see this and have a blog, please let me know) sent me a stunning green print from the Daydreams collection by Deb Strain for Moda. The colors are perfect for me. She was also kind enough to send me a vintage looking postcard and mini composition book. Thank you! Bethany sent me a really striking floral fabric. The colors really jump out at you. I cannot wait to use it. Look at the cute Grinch card she sent along. I love him! Hop over to her etsy shop and see her handmade creations. I have two more to add. I will try and get some pictures snapped and put up here tomorrow. Thank you to everyone for such great fabric! I hope you all liked what I sent. 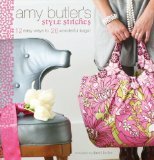 I am participating in two fat quarter swaps one at Stitches and Scissors and the other over at Sew, Mama, Sew. Last night I finally got all of my packages assembled and today I mailed off all 9 packages. Ladies, be on the look out, they are coming soon. I promise! As soon as I get all of my swap packages, I will post what I recieved so you can all turn green with envy.